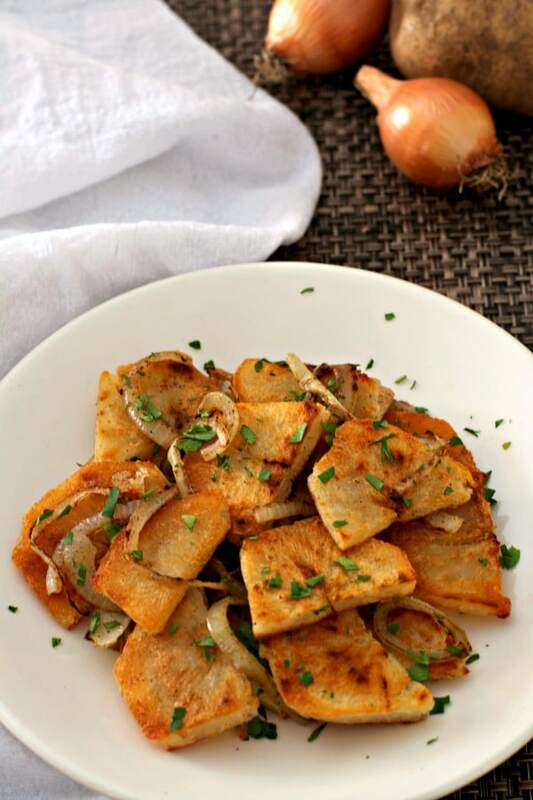 Lyonnaise Potatoes is the classic French side dish of potatoes and onions pan fried until crispy and tender and tossed with fresh parsley. It’s the perfect accompaniment for a special holiday dinner and easy enough to serve at a weekday meal too! This post is sponsored by BJ’s Wholesale Club, but my love for their fresh, affordable products are my own. Lyonnaise Potatoes is my go-to holiday (or anytime) side dish. Crispy on the outside and fluffy on the inside, this potato recipe never disappoints and is perfect with any main course. Typically fried in butter, I like to use whatever fat I have on hand in the house, to punch up the flavor. I used duck fat in this recipe because I roasted a big beautiful duck the other night and had a bunch of the rendered fat leftover. For a vegetarian easy potato recipe, feel free to use butter. For a healthy veggie recipe or vegan potato recipe, use coconut or avocado oil. To make any potatoes super crispy and fluffy, it’s best to par-cook them to remove any excess starch. You can par-cooked them by any method (bake, boil, or microwave), it really just comes down to a personal preference. Leftover baked potatoes are great in this recipe too! Using precooked potatoes is a huge time saver and adds to the convenience making it perfect for a quick side to a weeknight dinner. Recently I was given the opportunity to collaborate with Bj’s Wholesale Club and I was curious…could a girl who primarily eats farm-to-table shop at a wholesale club? Let’s face it, I live in the cold tundra of New Hampshire so my local farm veggie options are limited to cold storage ones in the winter and limited farm meat supplies. Also I eat things like artichoke hearts and kalamata olives in large quantities, both of which are either hard to impossible to find locally grown. Well, I’m happy to report that BJ’s carries both the artichokes and olives in HUGE containers AND the prices are way less expensive than my local grocery store. YAY!!! 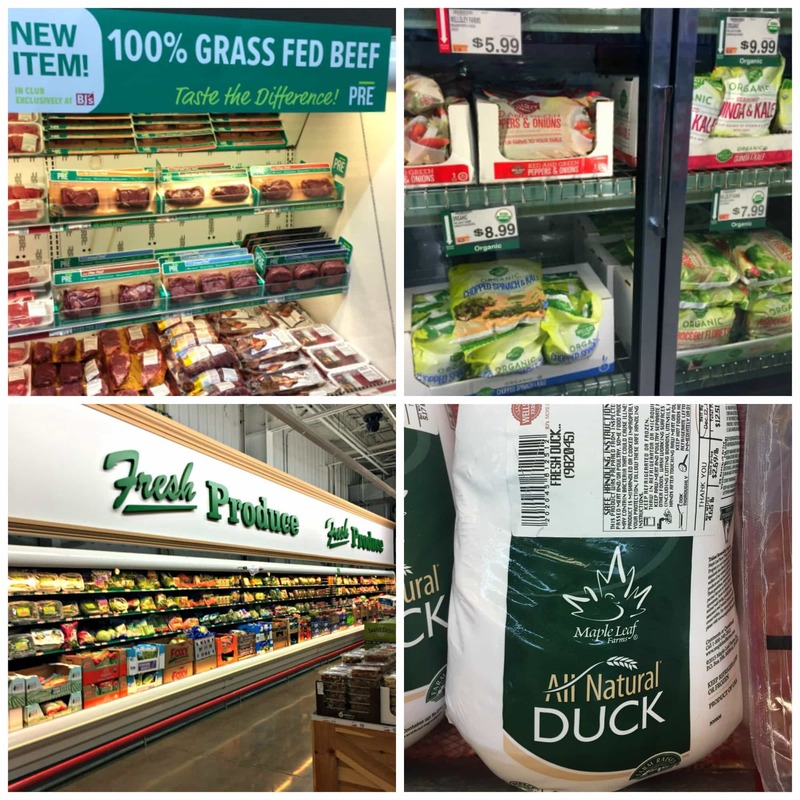 Grass-fed Beef: WOW! If I were a leprechaun, this would be my pot of gold…a whole section of grass-fed, no antibiotics ever, born and raised in the USA ground beef and steaks. Good selection of top sirloin, ribeye steaks, and strip steaks at reasonable prices. The ground beef was packed in 3- 1 pound packages for an amazing $13.99. That’s an incredible price! I ended up not trying any because my freezer is packed solid with farm beef and lamb right now, but I will be returning once my supplies run low to try it out. Organic, non GMO frozen veggies: During the winter, I go through a good amount of organic frozen spinach so when I spied a big 4 pound bag of spinach and kale mixture for half of the price than what I pay at the grocery store, I snatched it up! Took it home to make creamed spinach and kale and it was delicious. I also bought a 4 pound bag of organic frozen peas because I plan on making a lot of pasta carbonara this winter (I like to put some peas in mine to make it “healthy”). Great quality on both and I plan on keeping a bag of each of these in the freezer. Organic fresh veggies: Again, lots of choices in the organic department, like tomatoes, salad greens, kale, and Idaho potatoes, which I bought to use in today’s recipe. All fresh and high quality. Beer and wine and champagne! Oh my! : Here in New Hampshire, we have state liquor stores that have wine, champagne, and beer at crazy low prices so everyone goes there to buy the goods. Luckily, Bj’s prices are the same as the state liquor stores, so it’s pretty nice to be able to pick up some grass-fed beef for dinner and a bottle of bubbly at the same time. Hors d’oeuvres: To make shopping at BJ’s even more pleasurable, hors d’oeuvres are passed around as you weave in and out of the aisles. 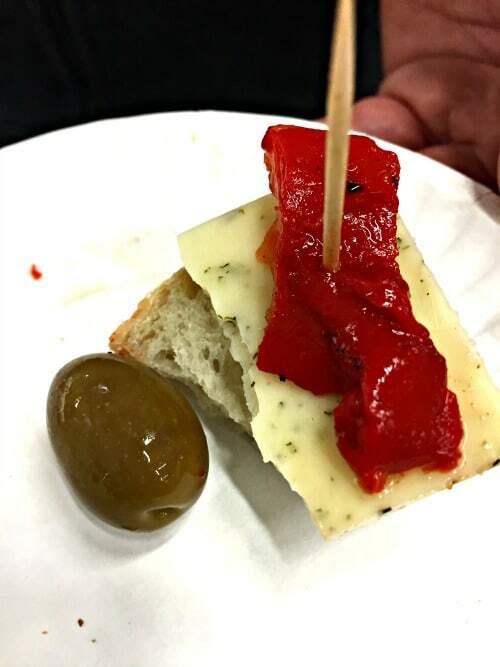 Okay, it’s not really hors d’oeuvres, it’s really food samples that you can munch on (like this slice of french bread topped with dill Havarti cheese and roasted red bell peppers and served with a cute lil’ olive). Hors d’oeuvres or food samples, whatever you call it, if you feed me, I will shop in your store all day. In addition to food, Bj’s also carries many different items, like electronics, jewelry, toys, books, clothes, household cleaners, etc, etc. Yeeeesssss! One stop holiday shopping for me! WoooHoooo! 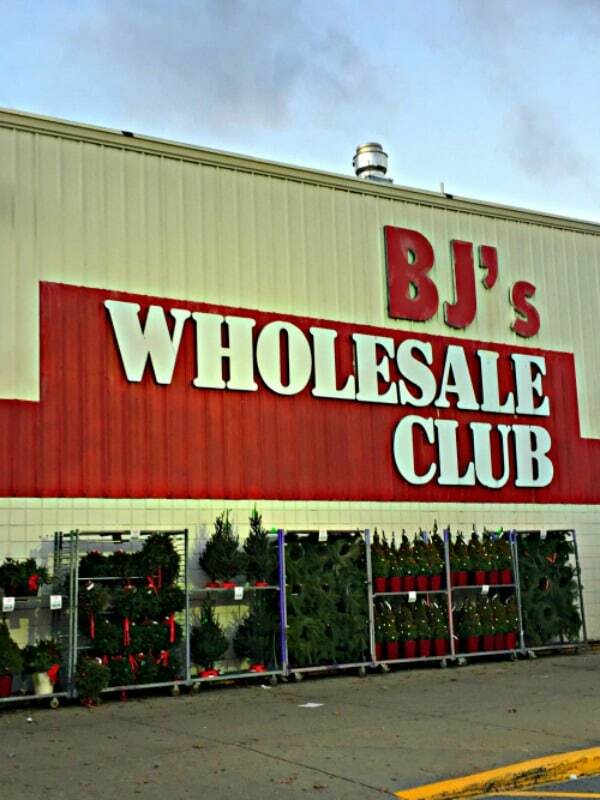 I’m glad I had the opportunity to check out what Bj’s has to offer for easy and affordable entertaining this holiday season. While you are there, don’t forget to grab a bag of organic potatoes to make this classic Lyonnaise Potatoes dish for your holiday table. Hope you enjoy this Lyonnaise Potatoes recipe and don’t forget to PIN it for later! 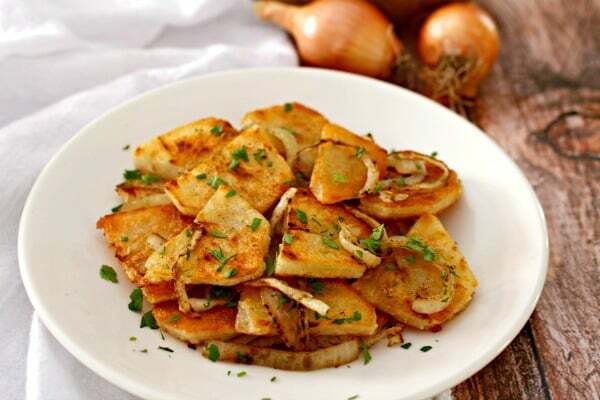 Lyonnaise Potatoes is the classic French side dish of potatoes and onions pan fried until crispy and tender. Preheat oven to 400F/204C degrees. Pierce each potato several times with a fork or knife tip and bake in the preheated oven until tender, about 45 minutes. (Can also pre-cook potatoes in a microwave for a time saver). Allow potatoes to cool slightly. Peel the potatoes, if desired, and cut in half lengthwise, then cut each half into 1/4" slices. Set aside. In a large skillet over medium-high heat, heat 2 tablespoons of butter/fat until melted. Add half of the potatoes and sauté until light brown, about 4 to 5 minutes. Add half of the onions and a little salt and pepper, then continue cooking until potatoes are a golden brown and onions are just cooked through, about 7 to 8 minutes. Remove from pan and set aside to keep warm. Repeat the process with the remaining potatoes and onions. 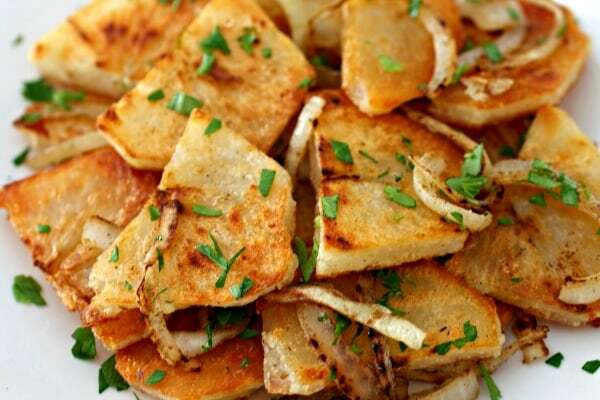 When all potatoes and onions are cooked, toss with the fresh chopped parsley and serve immediately. Your photos are making me… hungry! Those peanut butter cups, hellooo! I absolutely love potatoes as a side dish and the rest of my family does, too, so I”m going to put this on my What to cook for Christmas board on pinterest 🙂 Have a great day! There’s nothing better than the combo of potatoes and onions. Even lavender cannot beat it haha:) Indeed, I haven’t tried this method. Usually you finish up potatoes in the oven while here you’re starting with it. Interesting! But I clearly see thr results – beautifully roasted potatoes. Perfection, Karrie! I have never had Lyonnaise Potatoes, but I am so much in love with the name, Karrie. I love potatoes like anything, and this classic French side dish of potatoes is making me drool. Love how delicately they are pan fried and tossed with fresh parsley. Pretty and beautiful holiday dinner. MY DAD MAKES THESE ALL THE TIME! I don’t eat potatoes because I actually do not really like them (just the sweet potatoes) but man, I have loads of memories of my dad making these kinds of potatoes ALLLLLLL the time when I as growing up! I am sure he still makes them now too, but I just don’t go home often enough to see! We used to serve these at a restaurant I worked at while I was in college. I’ve never made them and forgot all about them! These were always one of my favorites and I can’t wait to have them again! You have the ability to draw a smile on my face even in hard times…wish we lived closer so i could come with you and shop together at Bj’s. Plus, I am so glad we don’t have to wear a bikini any time soon, too 😉 .I love potatoes and your Lyonnaise potatoes look scrumptious, so crispy on the outside! Holy moly! 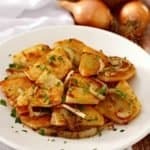 Potatoes fried in fat – uh… YEAH! Is there anything better?! Particularly duck fat, I’d be all over that one! This is definitely going on my Christmas table! I don’t know…. Does it get any better than potatoes fried in duck fat? I’m going to have to think long and hard about this one…I have a feeling I’ll be thinking for a very long time! These are fabulous!! I dont think we have BJ’s wholesale club in australia but I wish we did mainly for those peanutbutter cups haha. But these potatoes!! I cannot wait to do this to next weeks left over roast tatties. It’s easy and delicious recipe. My husband will love this :). Thank you very much for your sharing!!! Every holiday table could use some potatoes! 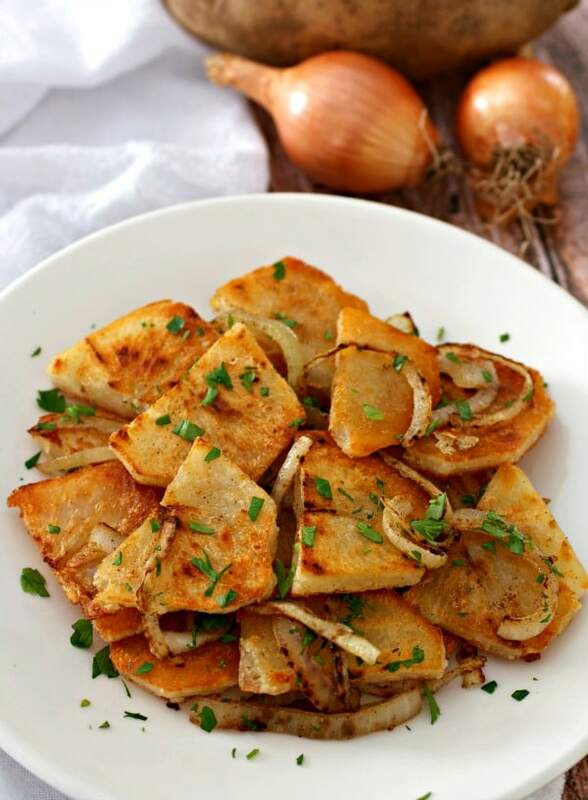 I’ve never had lyonnaise potatoes (at least I don’t think I have), but they sound delicious! Anything cooked in bacon fat is instantly good! Potatoes fried in duck fat! You really are toying with my emotions! hahaha I’ve never heard of Lyonnaise potatoes. I’m glad you put these on my radar!